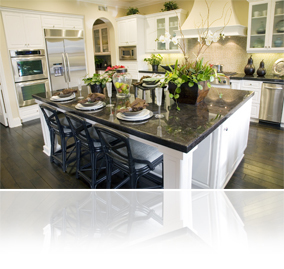 Start by making sure your kitchen appears as roomy as possible. Put away all countertop appliances, even the toaster and the coffee machine, so that the counter space is completely clear. Check that your cabinets and pantry shelves aren’t stuffed with dishes, foodstuff and other items. While that’s normal in most family homes, it doesn’t promote the image of plentiful storage space. Clear out as much as you can. Make sure what you leave behind, especially food items, is stored neatly. Got a junk drawer? We all do. Empty the contents into a box and stow it away.